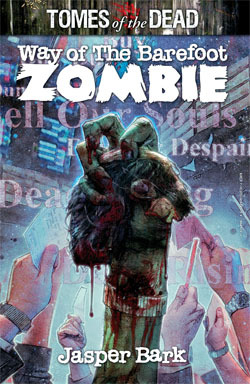 Abaddon’s Tomes of The Dead series consistently produce high quality, original zombie fiction. Whether serious, historical or tongue-in-cheek, the brand is synonymous with excellent horror literature. Innovative and well executed ideas continue with Jasper Bark’s Way of The Barefoot Zombie. Bark’s zombie adventure depicts elite members of society spending vast sums of money to study and learn from zombies on the private island of St Ignatius. Part-horror, part-satire, Bark manages to evoke both fear and laughter with impeccable timing. The tone of the tome is set early on when protagonist, Benjamin, recalls how his Uncle Brian “had been killed by a frozen turd.” As with his short, End of the Line, Bark immediately hooks the reader inside his fantastical world from the off. It is soon established that Benjamin, along with former lover, Tatyana are to join the Way of the Barefoot Zombie study program in St Ignatius in the hope that they can sabotage the antics and save the zombies from mistreatment. The zombie liberation group idolise the living dead, referring to them as noble monsters. These anti-capitalist zombie lovers are determined to do whatever is necessary to bring justice and peace to the zombies, echoing the hypocrisy of animal activists who will stop at nothing to save animals even if it means the loss of human lives. In St Ignatius, the rich must learn to simulate the actions of zombies so that they can apply this knowledge to the financial world. Bark depicts a world where the wealthy must dispose of restrictive influences like their conscience and social customs. The irony is played upon throughout. A darker turn is taken as the cold stark reality of the rich is stripped bare. A world where to humiliate and scorn the poor is to succeed and to empathise is to show weakness. Benjamin initially despises everything that the super-rich stand for, yet the need to fit in and inevitable consequences muddy the class boundaries and his own identity. Readers will be sucked into the relationship politics between Tatyana and Benjamin and the darker relationship that Tatyana has with her Father. The parallels between her concealed past and the cryptic back story of the island raise intrigue and questions. Way of The Barefoot Zombie is a multi-dimensional story of murder, corruption, voodoo and gluttony. Bark has opted to depict voodoo zombies, a choice that pays off perfectly as the history of St. Ignatius slowly unravels. Bark has mastered the reveal, providing teasers and offhand comments that point towards secrets and game-changers. The precise timing of each reveal has been engineered for maximum effect. Way of The Barefoot Zombie will make you laugh, cry, tremble and clench your fists. On the surface this is a fun, comical horror but the questions and consequences it raises about humanity and just how far one will go to get ahead are chilling. Bark has created a story that is richer and more rewarding with multiple reads. The wasteland may not be as desolate as the hopeless worn out landscapes in Moody’s Autumn but the underlying message is just as cutting.